Less than three years after buying the former Gawker Media Group titles, Univision has sold them off, as well as The Onion and its associated properties. 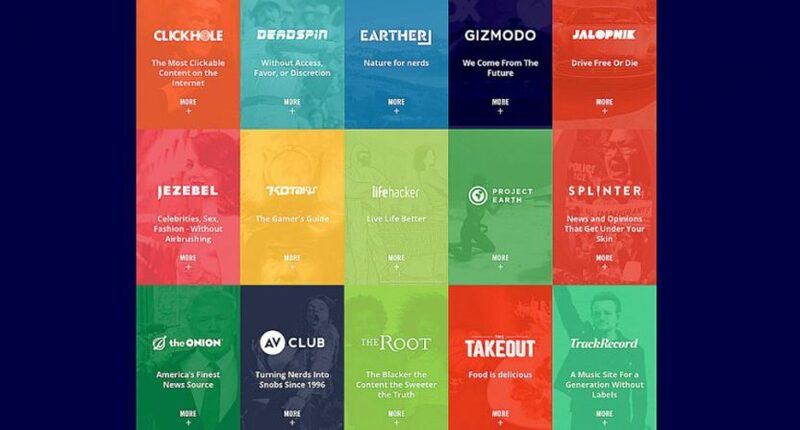 The former Gawker Media properties now known as Gizmodo Media Group have another new owner. Univision acquired those properties (including Gizmodo, Jalopnik, Jezebel, Deadspin, Lifehacker, and Kotaku) for $135 million in the Gawker bankruptcy auction (following the Hulk Hogan lawsuit) back in August 2016, but indicated last summer that they were exploring selling those sites, as well as The Onion, The A.V. Club, The Root, and others. And now, as Benjamin Mullen of The Wall Street Journal reported Monday, those properties have been acquired by private equity firm Great Hill Partners for “much less” than Univision paid. With the sale, Great Hill will form a new company called G/O Media Inc., headed by digital content industry vet Jim Spanfeller, who also will be a “significant investor” in the company. The sale puts an end to Univision’s bid — under then-CEO Randy Falco — to diversify beyond its Hispanic broadcasting core business into what it had hoped would be a fast-growing, young-skewing mass digital play. …Univision had said last summer that it was looking to offload the digital-media assets. With the exit by Falco and appointment of TV veteran Vince Sadusky as Univision’s CEO, the company decided to full return to its focus on Hispanic media and marketing. What will that mean for these sites? Well, Spangler writes that Univision said the Gizmodo Media Group and Onion sites will continue to operate as “independent assets within the Great Hill Partners portfolio,” and that “all employees of GMG and The Onion will be joining G/O Media.” That doesn’t mean there won’t be layoffs following the acquisition, though. · We are action oriented. When faced with an option of action vs. in-action, we always choose to DO SOMETHING. At any rate, it’s certainly notable to see the Gizmodo titles exit Univision for a new owner. The combined Gizmodo/Onion sites have 100 million unique visitors per month as per the company’s release, so they remain a significant player on the web. But the “much less” price than the $135 million Univision paid for the Gawker assets (not counting what they paid for their stake in the Onion sites) after almost a year of searching for a buyer illustrates the wider challenges out there in the digital publishing world. We’ll see what’s next for the Gizmodo titles.